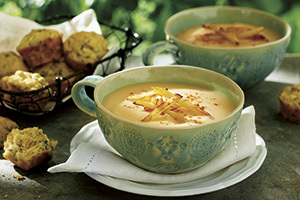 Hints of maple and apple round out the flavour in this smooth soup, garnished with thin rutabaga 'fries'. Peel rutabaga. Cut about 24 rutabaga sticks, each 1-1/4-inches (3 cm) long and 1/4-inch (5 mm) wide. Set aside for garnish. Cube remaining rutabaga. In large pot, melt half of the butter over medium-low heat; add shallots; cook, stirring, until softened but not browned, about 3 minutes. Add apples, broth and cubed rutabaga; bring to boil. Reduce heat and simmer, covered, until very soft, about 35 minutes. Meanwhile, in large nonstick skillet, melt remaining butter over medium-low heat; cook rutabaga sticks, turning often, until golden brown and tender, about 5 minutes. Remove with slotted spoon to a paper towel lined plate. In batches, purée soup in blender or food processor until smooth; return to pot. Stir in cream and maple syrup; add more broth or water if too thick. Season with salt and pepper to taste. Reheat gently and serve in heated bowls. Sprinkle rutabaga sticks with salt; divide among servings. Garnish with sprinkle of paprika. Serve this soup with Savoury Parsnip Parmesan Mini-Muffins.